A day after senior Congress leader Mallikarjun Kharge indicated that current Karnataka Chief Minister Siddaramaiah may not be the automatic choice of the party for state's top job if it wins the May 12 assembly polls, the latter said on Wednesday that he remains the frontrunner for the post. In an exclusive interview to Smita Prakash, Editor, ANI, the Congress strongman in Karnataka said that since the party is fighting the polls under his leadership and it makes him a natural frontrunner. The assembly elections are just 17 days away and both the Congress party and the Bharatiya Janata Party (BJP) are locked in an interesting yet aggressive political battle to establish their presence in this south Indian state. Siddaramaiah expressed confidence that the Congress will win the elections on the basis of the good performance put in by his government over the previous five years, and added that the people of the state are "happy" with the state government's performance. On being asked about the challenge that he faces from the BJP and Prime Minister Narendra Modi in particular, he described the BJP as a communal party and Prime Minister Modi as someone leading that outfit at the national level. "Modi is there at the national level, but BJP is a communal party, whether at a national or state level. We have to defeat the communal forces. Winning is the first criteria, next is social justice. We have followed and are following these two things," he said. When asked whether he had come up with a winning formula from BJP president Amit Shah's "book", the Karnataka chief minister said, "Amit Shah's is not at all a good strategy. It has happened that somehow he has won. He did not bring any strategy in Karnataka." He also rejected allegations made by the BJP and by Home Minister Rajnath Singh that the Congress and by extension his government had engineered political violence in across the state in the run-up to the polls like in neighbouring Kerala. "The BJP is creating a bad atmosphere and spoiling peace in society. I have done enough to crackdown on (anti-social elements). He also said that the H.D. Devegowda-led Janata Dal-Secular party is "not committed to secularism." "They are already with the BJP in a coalition govt. They are there for 20 months in Karnataka. In the municipal elections, they came with us and not before," he said. He also ruled out suggestions of there being a hung assembly post-elections. "There is no case of a hung assembly according to me. Thus, it does not rise at all," he said. When asked why he had chosen two constituencies (Chamundeswari and Badami) to fight elections from, he said there was a feeling within the Congress and among his supporters that he should contest from both North and South Karnataka. "People from my party wanted me to contest from North Karnataka. If I contest from north, it will help in neighbouring districts," he said. When asked whether he had chosen to file his nomination for the Badami assembly constituency because he was not sure about winning from the Chamundeshwari constituency, Siddaramaiah confidently said, "I have gone to Badami only once. I have finished my campaign at Chamundeshwari. In this and in Badami, I will 100 percent win." "I will decide after elections which one will I give up," he said on being asked what if he won from both." He said that he did not want to be compared with any leader and that his sole objective was to ensure that the Congress returns to power in Karnataka. He also said that his relationship with former Prime Minister H.D. Deve Gowda was non-existent and rejected suggestions that he had walked out of the Janata Dal Secular many years ago to join the Congress. "No he (Deve Gowda) expelled me from the party .How can there be any relationship with Gowda. Relationship is cut," he said. He reiterated that he was a Congressman through and through. "No one is thinking like that. I am 100 % Congressman. I am committed to social justice and secularism," he said. When asked whether Congress party president Rahul Gandhi's campaign has been effective so far, Siddaramiah said, the youth of Karnataka like him. "His campaigning has made a big impact on the youth. He himself is a youth leader. The BJP is not committed to secularism or social justice," he said when asked to respond to the view that this is the only state where two Congress leaders Indira Gandhi and Sonia Gandhi have contested from, and whether Rahul has the same presence? On asked whether Karantaka is the gateway for the BJP to marking its political presence in the South, Siddaramiah said, "It is other way round. The victory of the Congress in Karnataka will happen and will be a stepping stone for (it) in the 2019 elections." When asked whether the Lingayat separation issue has backfired for both the Congress and the BJP, the Karnataka chief minister said, "Lingayat is not a gamble or new issue." He also criticised Prime Minister Modi for describing his government as one ridden with scandals. "Our govt. is scandal-less government. We are a clean party. This is a baseless and a politically irresponsible statement made by the Prime Minister. He should not have made such a statement. 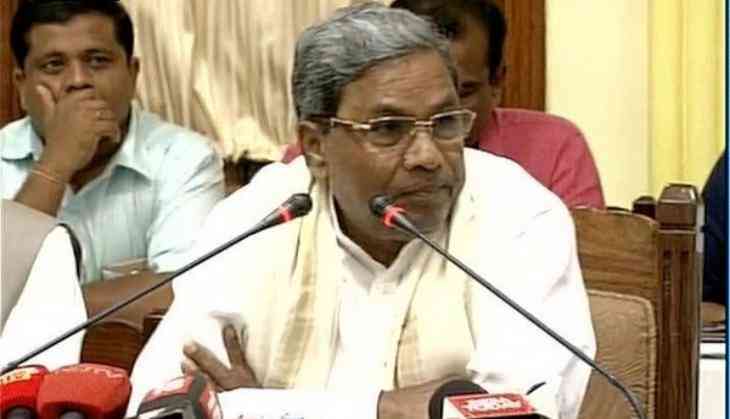 I will never make such a statement," Siddaramiah said. "I never said I am going to a temple. I am not going to temple at other places like Kashmir, but only where it is necessary. I will do rituals on demand made by the people," he said in response to a question on why he was visiting temples when it was well known that he did not believe in rituals. "Our task is to fight the BJP and bring the (Congress) party back to power," he said. In conclusion, he said there were three key areas that needed his government's immediate attention. There were improving irrigation, infrastructure and power. He also said that he would also concentrate on improving drinking water supply and social security programmes to take Karnataka to number one position.